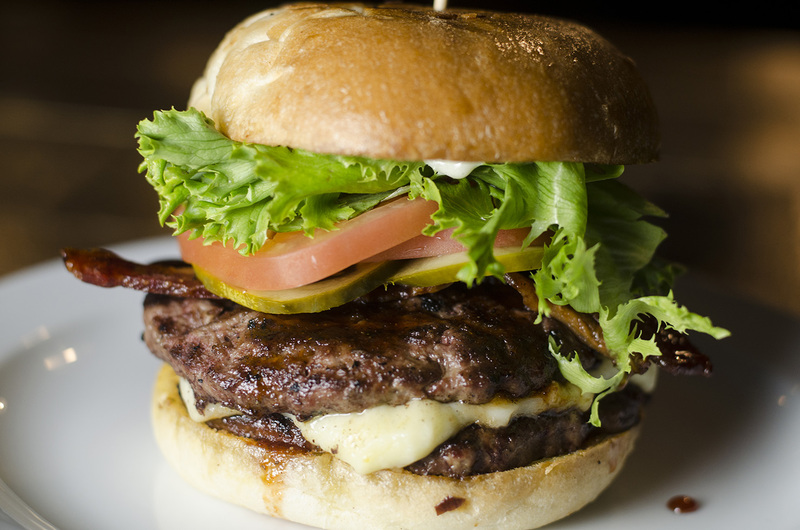 People who live in and around Windsor, Ontario know they’ve got it made when it comes to burgers. The locals love them and the chefs cooking them know they’ve got to step up their game in order to make their burger stick out. 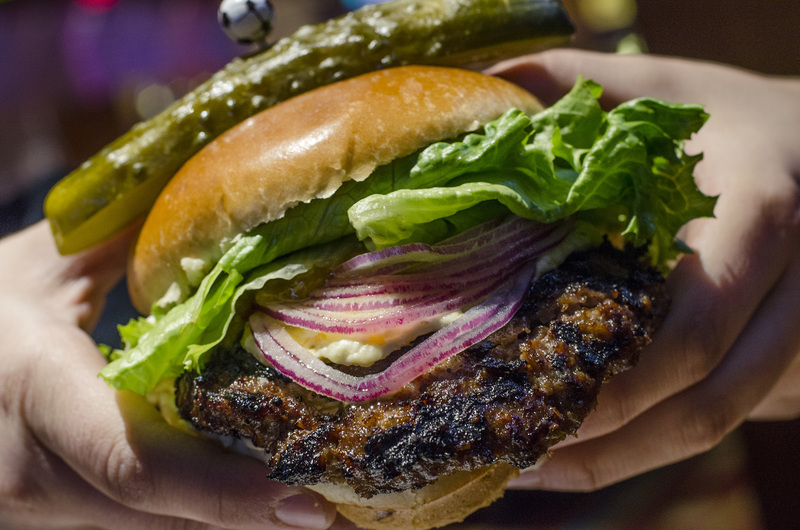 To help guide you in deciding where you can get your hands on some of the city’s best tasting burgers, we’ve released our list of 2018’s Must-Try Burgers. From Granny Smith apples to Gouda cheese, pineapple to pierogis, the list of toppings makes our selections anything but your average burger. Have you tried any on the list? Did we feature your favourite? Did we leave anyone out? Are you cursing us because we just destroyed your diet? Let us know in the comments! We’d love to see you enjoying these burgers. Share your photos on Instagram, Twitter and Facebook using #WindsorEats. 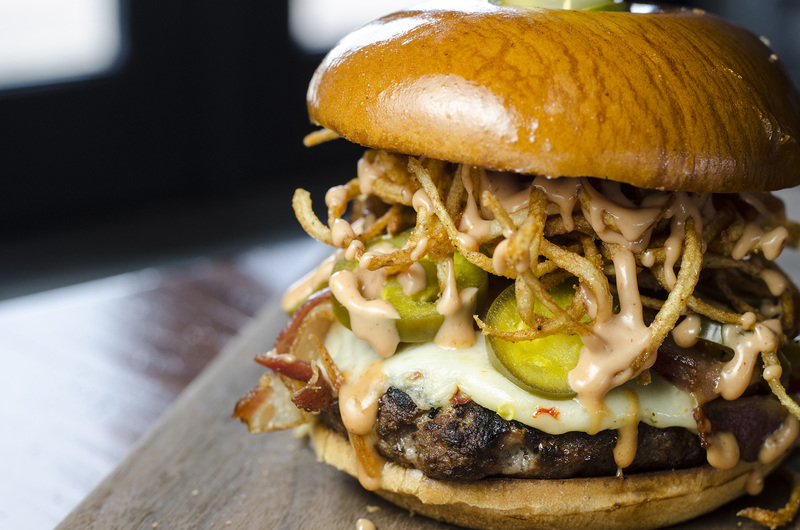 The Bodacious Bovine from The Loose Goose. This burger is a lot bigger than it looks. Two patties with Wisconsin cheese curds in between, beef brisket bacon, honey sriracha BBQ sauce, horsey sauce, lettuce tomato and dill pick on an onion Kaiser. Be sure to order it on an empty stomach! Tasty Tip: Be certain you’re really hungry when ordering this. It fills the belly good! The Big Eatery Mac from Walkerville Eatery in Windsor, Ontario. This burger gets messy! Two 4oz local beef patties with pickles, shredded lettuce, local cheese, red onion and Eatery sauce, all packed into a Blak’s Bakery onion roll. Make sure you have lots of napkins ready! 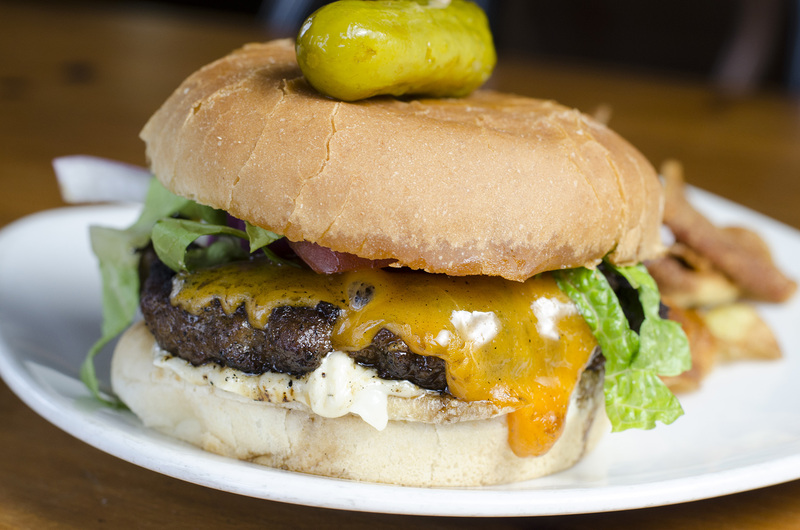 Tasty Tip: This burger is especially tasty when paired with a Pint of Frank’s Cream Ale. The Flyin’ Hawaiian from Motor Burger in Windsor, Ontario. As the debate around pineapple on pizza rages on, Motor Burger may have added burgers to the discussion. 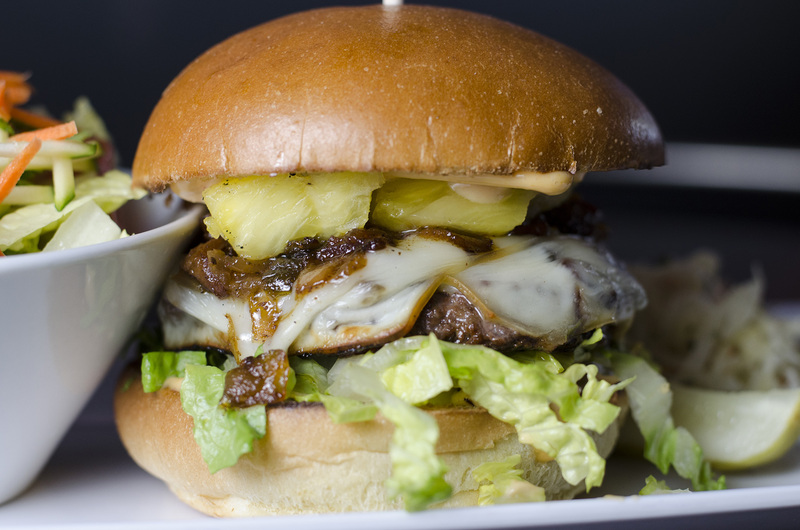 The Flyin’ Hawaiian is more of a completely well balanced burger with char-grilled beef, jalapeno-bacon jam, marinated pineapple, smoked mozzarella. Sweet + savoury + heat = delicious. Tasty Tip: Pairs incredibly with the Chop Top IPA from Motor Craft Ales. 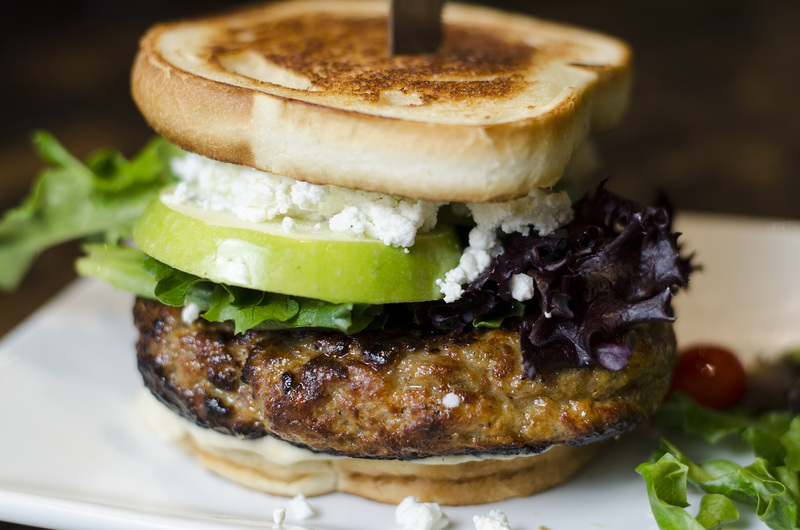 The Goat Cheese Turkey Burger from Wolfhead Distillery. Just in case a beef patty is too heavy for you, Wolfhead Distillery is offering up a lighter option. Made with charbroiled local ground turkey, onion aioli, goat cheese, heritage mix, Granny Smith apple slices inside toasted sour dough bread. Tasty Tip: A Manhattan served on the rocks, pairs perfectly with the goat cheese turkey burger. Lotsa Mozza Burger from Joe Schmoe’s in LaSalle, Ontario. 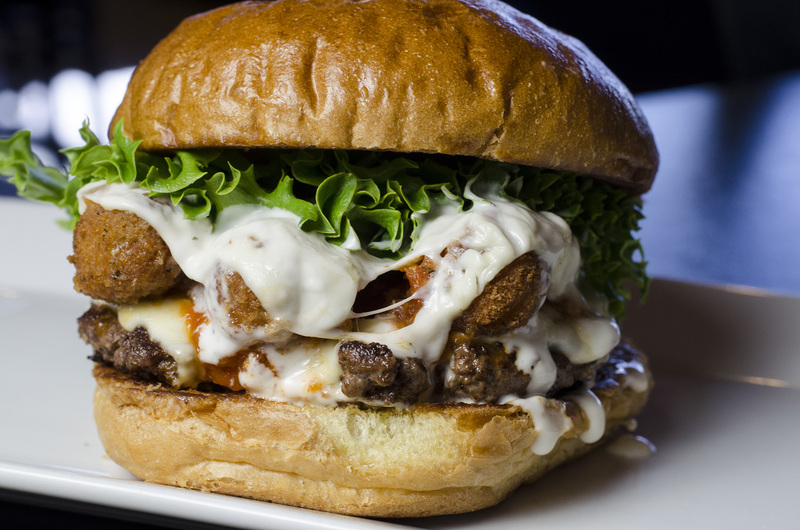 There’s two things that are a must if you’re ordering this burger: a monster appetite and an insatiable love for cheese. 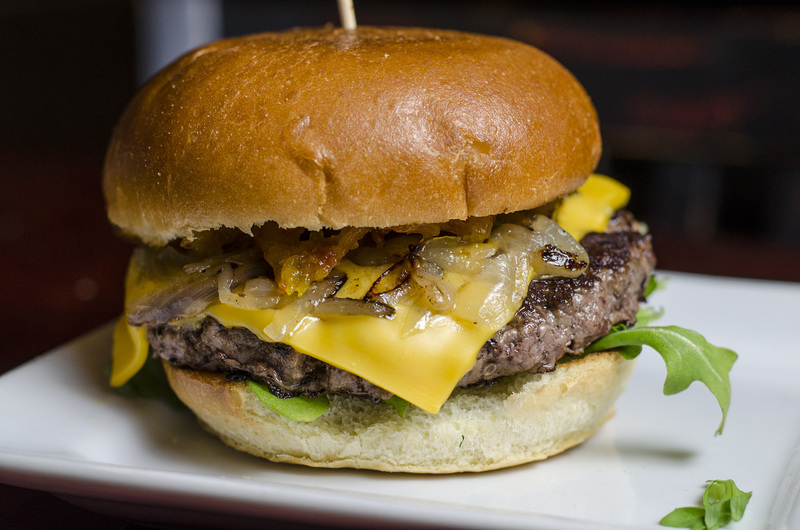 The burger starts off innocent enough with an 8oz certified Angus beef patty. However, that’s where innocent ends. Next comes some mozzarella cheese, full-sized breaded mozzarella sticks, marinara, ranch, and lettuce on a brioche bun. It’s pretty much an appetizer-burger combo. The best of both worlds. Tasty Tip: As with all of their burgers, we recommend a cut in half or a two handed approach because they be biggens. Also, wine pairs well with cheese, right? 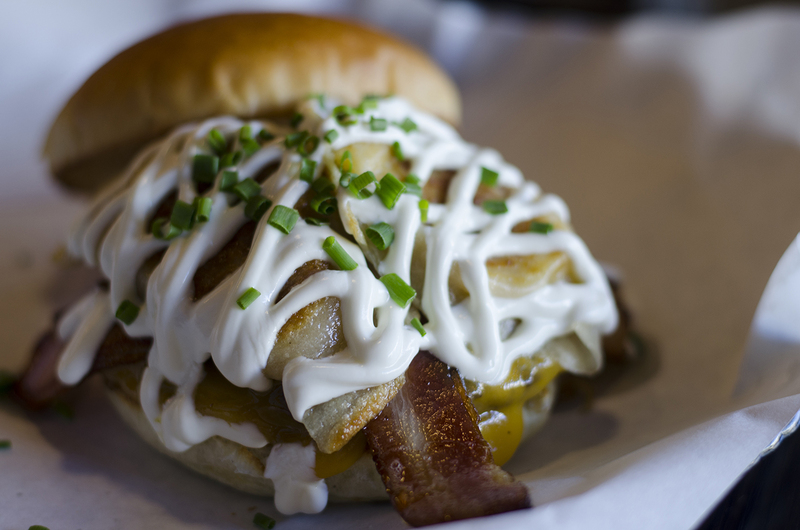 The Pierogi Burger from MamO Burger in Windsor, Ontario. A beef patty that’s doused in cheddar cheese, sour cream, caramelized onions, bacon and classic cheddar pierogi from Little Foot Foods. It’s perfect for Snapchatting to your friends just to make them jealous. Tasty Tip: Ask for a small serving of their BBQ sauce to pour over the pierogies. You won’t be disappointed. A classic cheeseburger at Rino’s Kitchen in Windsor, Ontario. With a menu that features interesting unique items, Chef Josh Fraser wanted a classic that anyone, even the non-adventurous, could enjoy. He believes his method of cooking it in cast iron pans makes a big difference. We agree. You get a nice crunch from the sear and it remains juicy as it cooks in its own fat, rather than everything dripping off into the grill. Tasty Tip: Visit on Tuesdays when Rino’s Kitchen has their burger and pint special. For the regular menu price of the burger, you also get a pint from their rotating tap lineup. The Surf n’ Turf burger from The G.O.A.T. 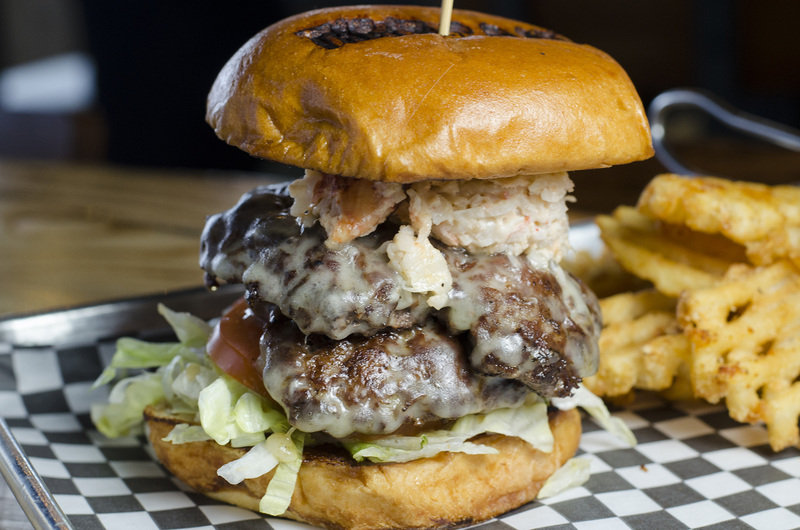 The Surf n’ Turf burger from The G.O.A.T.Everyone loves a good surf and turf meal. Hand packed, 100% ground chuck patty, shredded Atlantic lobster, green onion, iceberg lettuce, Leamington tomatoes, and Havarti cheese on a branded, brioche bun. We made sure to mention the branded bun because it adds a great charcoal grill-esque flavour with each bite. Tasty Tip: If you’re packing an appetite, be sure get get a double patty. The Onion Jack from The Manchester in downtown Windsor, Ontario. This burger got its start as a featured burger of the week. The response to it was so huge, it made itself comfortable on the regular menu. 8oz. 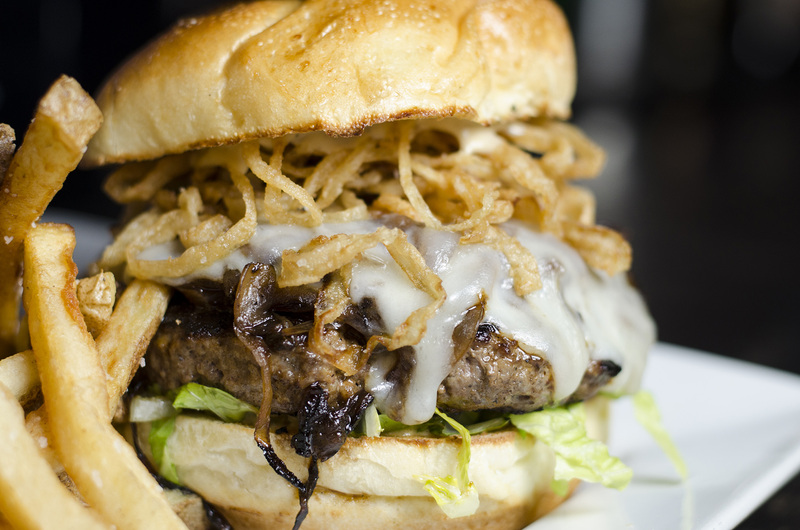 freshly packed all-beef patty, topped with caramelized onions, fried onion strings, lettuce, roasted garlic mayo and double jack cheese. Tasty Tip: Pairs well with any of the lagers on tap. The Burger from Snackbar-B-Q in Windsor, Ontario. 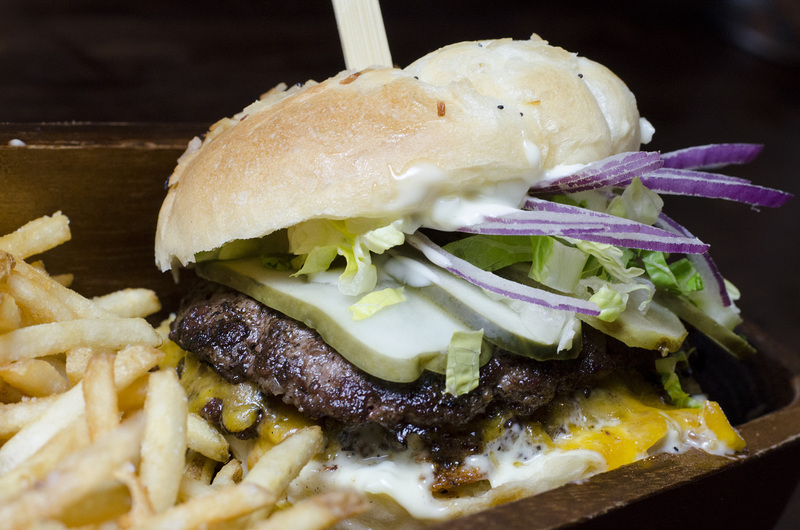 Chef Jim Renaud didn’t want to put just your standard burger on the menu. That’s not how he rolls. So instead, he took ground Canadian Angus, caramelized onions, bacon and bourbon jam, arugula, garlic mayo and crisp onion rings and placed them all into one treat simply known as, The Burger. The jam and the Angus meat combine extremely well together. The Hangover burger from Thompson House in Windsor, Ontario. They don’t serve breakfast, but, The Thompson House comes pretty close with The Hangover burger. 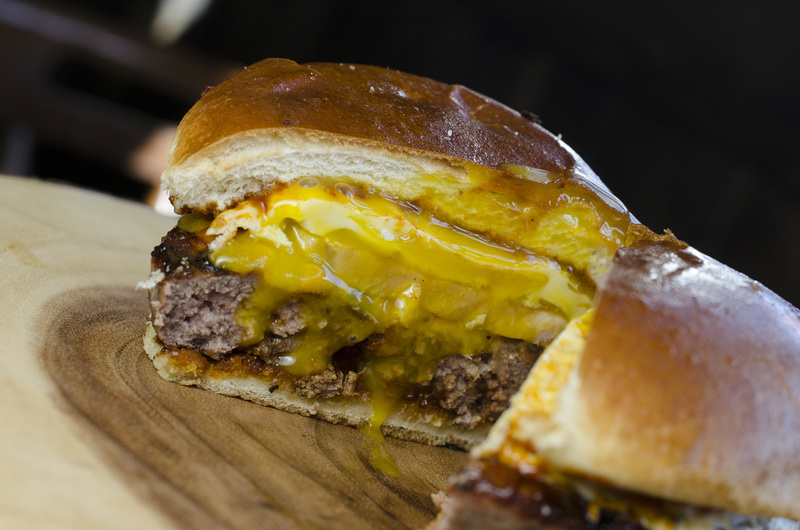 Ground chuck, peameal bacon, a fried egg, American cheddar and their signature barbeque sauce on a lightly toasted brioche bun makes for a complete breakfast in a burger. Also, the egg is made sunny side up so once the yolk breaks and combines with the rest of the toppings it just adds to the awesomeness of the flavours. Tasty Tip: What’s another popular hangover cure? A Caesar, of course! This Burger from Legends Sports Bar within Caesars Windsor in Windsor, Ontario. This burger actually made its way to the menu because of a customer suggestion. A few summers ago, Legends ran a Jerk Burger special. A guest ordered one and add the three cheese blend to his order and loved it and it has been on the chefs mind every since. The burger starts with a Jerk marinated patty with habanero peppers, onions, allspice, cinnamon, garlic, ginger and soy sauce. It is topped with a three cheese jalapeno blend, lettuce, red onion, chipotle mayonnaise and delicious peach chutney. Tasty Tip: One of the juiciest burgers you’ll ever have, so, extra napkins are a must. The Jalapeno Chipotle Burger from Billy’s Taphouse in Essex, Ontario. Despite a regularly changing menu with each season, the Jalapeno Chipotle burger is so good it has managed to stick around for over 5 years. It’s a beef patty with bacon, habanero jack cheese, jalapenos, barbeque chipotle sauce and potato crisps on a fresh brioche bun. Tasty Tip: When a restaurant offers fresh cut fries you can never turn them down. Ever. The Beacon Burger from Beacon Ale House in Amherstburg, Ontario. 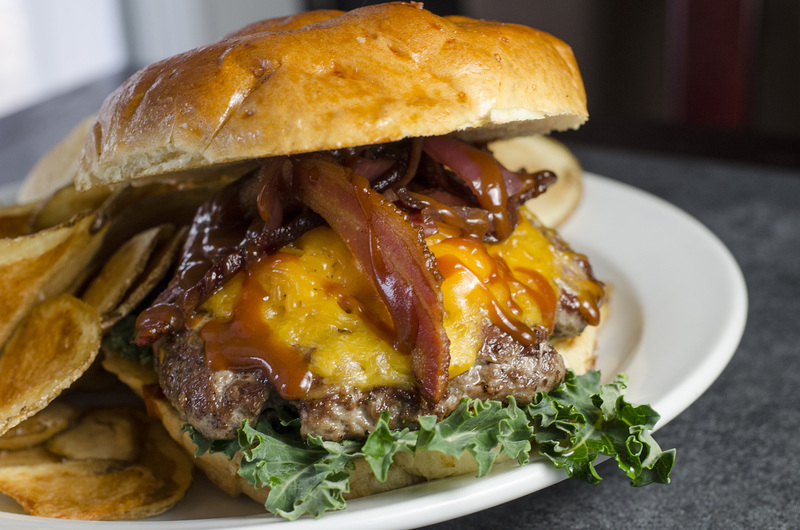 This burger has been a staple on the menu since Beacon Ale House opened. Fresh kale, roasted garlic aioli, cheddar cheese, thick Berkshire bacon and hand-pressed burger patty with Stout BBQ sauce, slow caramelized onions slathered on a brioche bun from Blak’s Bakery. Tasty Tip: An extra side of garlic aioli is highly recommended for dipping the burger and Beacon chips.